The last World’s Most Attractive Employers Rankings 2015 by Universum give an insight on what Millenials are seeking professionally. What are the trends? What are the lessons? Read and find out! 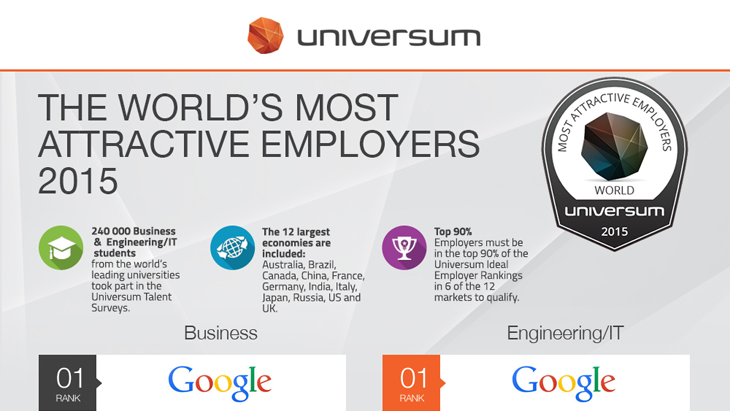 Universum has surveyed a huge amount of students worldwide and asked them a simple question: Which company would they like most working for ? The students were either from an engineering school or from a business one: two rankings were that way realized. What are the values attracting our Millenials? As mentioned in the article about Generation Y, Millenials or Digital Natives don’t expect the same things from their career as their parents did. Values are appearing, shifting and evolving. Among those prevail creativity, innovation, flexibility, an international dimension but also a strong career progression opportunity and training. You’ve got it. This generation wants more. And they want it faster. Business schools students are favoring audit and consulting firms, but also investment banking and finance, which are experiencing a fast rise in the ranking. These two sectors represent half the Top 20 this year. Yet Google is remaining the first choice. And that’s the interesting part. Indeed, companies from certain sectors such as Luxury cosmetics and Technology are rising. Two examples: Apple (7th) and L’Oreal (11th). So we can observe that some industry leaders are gaining attention. We’ll see below why Google is so popular. But what you need to remember for now is that professional service firms seem to be the most attractive employers to our students. And according to Universum, this is because they provide students a good professional training and development. Engineering schools students are approximately favoring the same employers as last year. First comes once again Google, then Microsoft and finally Apple. 3 industries seem to be obsessing the students: Consumer electronics, Software and Computer Services, and Technology and hardware equipment. For Universum, this is because they all foster innovation and entrepreneurial qualities. When taking a look at the profiles of the most attractive employers in the eye of Millenials, we can see one key similarity: the desire to grow fast, to be given responsibilities and advance. Moreover, students, especially in engineering, are looking for cool places where corporate culture is chill, such as Google, Microsoft or Apple. But if Business school students may want the same thing, they’re ready to embrace jobs where the corporate culture is more formal or traditional in banks and consulting firms. Yet at the same time the interest for finance and consultancy is growing, this trend is less and less true, given that other companies offering more relaxed atmospheres such as Apple are appearing at the top. The best example is probably… Google, 1st in the hearts of both business and engineering students. Why? Because the company has developed a soft and flexible management style along a chill corporate culture. The cliché of Tech companies in the TV Serial Silicon Valley or in the movie The Internship portraying the lifestyle of workers at Google is almost true. But that’s not all. Workers are given the opportunity to grow extremely fast. You got it: Google employees have it all. And this is the image Google keeps sending : a multicultural, tolerant (LGBT support) place where you’re given the chance to shine professionally in a chill environment. What about you? 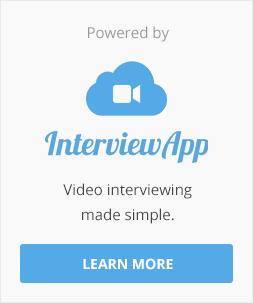 Is your company having the same features as the companies topping the rankings ? I’d love to hear from you!